When spring comes around, everyone wants to start sprucing up their home in time for the summer. As the days get longer than they were, it feels as though we all have more energy than we once did. That means that we have the drive to get up and get on with some essential DIY jobs. If you want to give your bathroom a makeover, now might be the perfect time to do it. Make no mistake – this project will take quite some time on your part. After all the hard work, though, you will have a bathroom of which you can be proud. One of the best new modern features has to be self-heating towel racks. When you jump out of the shower, the last thing you want is cold bath towels. Instead, you can use this rack to heat your towels so that you can wrap yourself up in utter warmth. If you don’t have an available power supply in your bathroom, you will need to have an electrician sort this issue out for you. If you want the room to look ultra modern and stunning, there is only one way to go. Modern LED lighting looks incredible in bathrooms because it has a futuristic feel to it. When you are covering the area, you need to think about what effect you want. The positioning of the lights is crucial to the way the bathroom looks and feels. You might want to get wall lighting so that the room looks as though it has little spotlights everywhere. Spend some time planning the design of your lights so that it looks interesting. Glass sinks and even tubs look incredible in any modern bathroom. If you want the room to look clean and quirky, you ought to consider investing in one of these features. You can get fixtures with invisible plugs so that it looks as though the sink is a piece of art. You will need a plumber to help you install these items so that you don’t mess up the current piping in your home. Find someone who you can trust to help you with this minor job. Before you do anything else, though, you should look down at the floor and see whether there is anything you can do there. If the bathroom tiles look old and dull, you need to replace them. Every DIY store has a range of tiles, and so you can pick from an array of different styles and sizes. Small, mosaic style pieces tend to have a dramatic effect, and so you might want to consider them for your home. You can get large tiles, which look as though they have loads of tiny mosaic pieces in them. That way, the job is straightforward from start to finish. Why stick to boring whites and blues? Instead, you need to dare to be different with colour. When you choose your bathroom decor colour, you need to think outside the box. 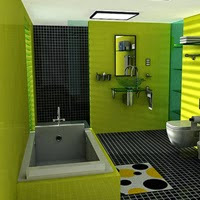 If you have a small bathroom, you can afford to experiment with different themes and designs. Choose something that conveys a happy and bright atmosphere. Before you undertake this job, it is worth noting that it will take a while to complete. Renovating an entire room is no simple feat, and that is something that you must keep in mind. Tackle one aspect of the job at a time, so that you complete the look in no time at all. Use these advice pieces to make the most of your brand new room.